This is a tale of two Caminos. 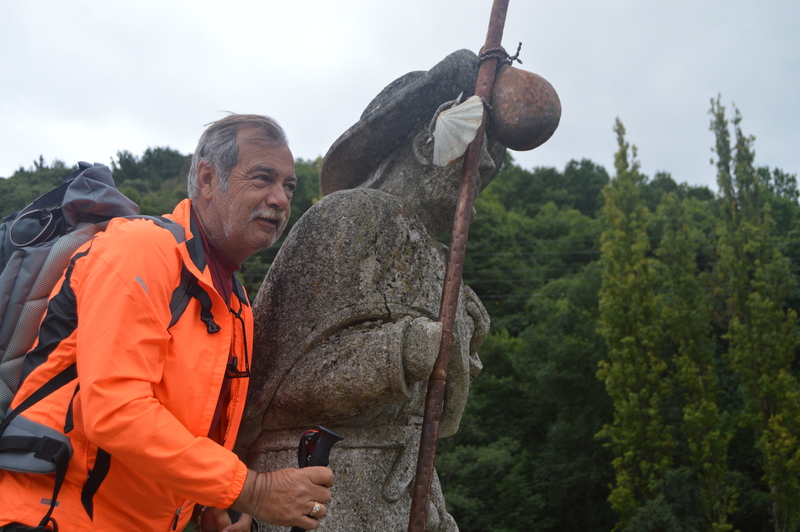 The difference between these two days is the greatest of any on the Camino. 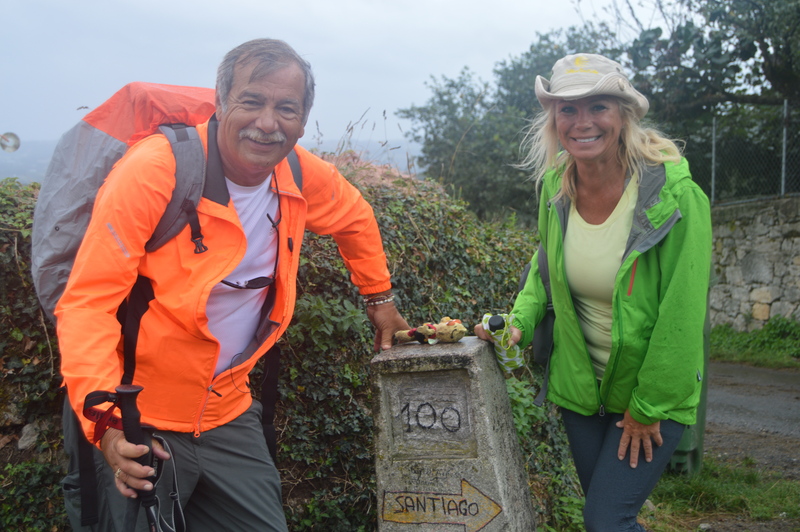 Here’s why: The goal of most Pilgrims is to reach Santiago and receive a certificate known as the Compostela, which is awarded to those Pilgrims who walk the last 100 kilometers to reach the Santiago cathedral. It just happens that Sarria is the last major city outside the 100 kilometer mark. 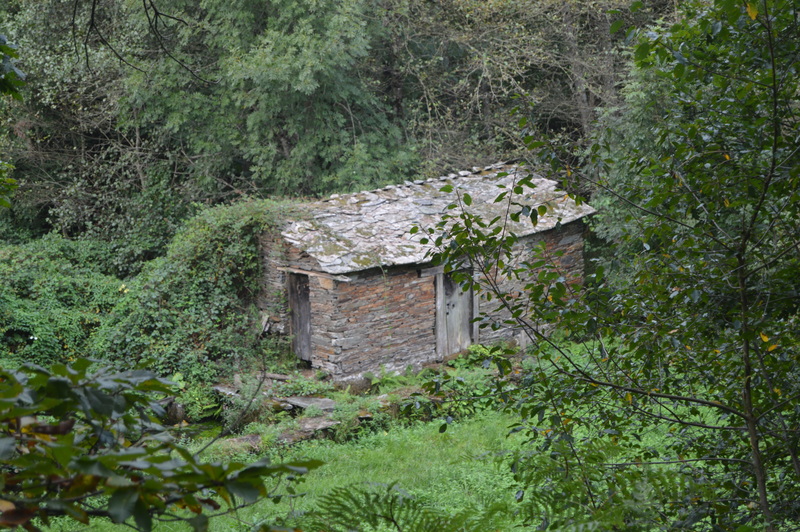 Therefore, Pilgrims on limited time schedules start in Sarria, and generally spend a week or less to reach the goal. And how were the two days so different? 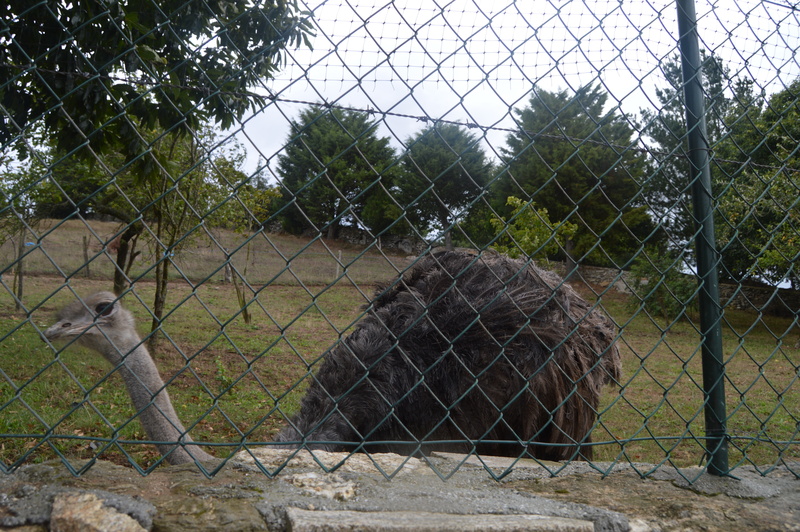 Day 26: We walked almost the entire day alone. We actually passed six Pilgrims and were passed by four during our entire walk yesterday. Most of the day was on a backwoods trail. There were a few monuments–not many. 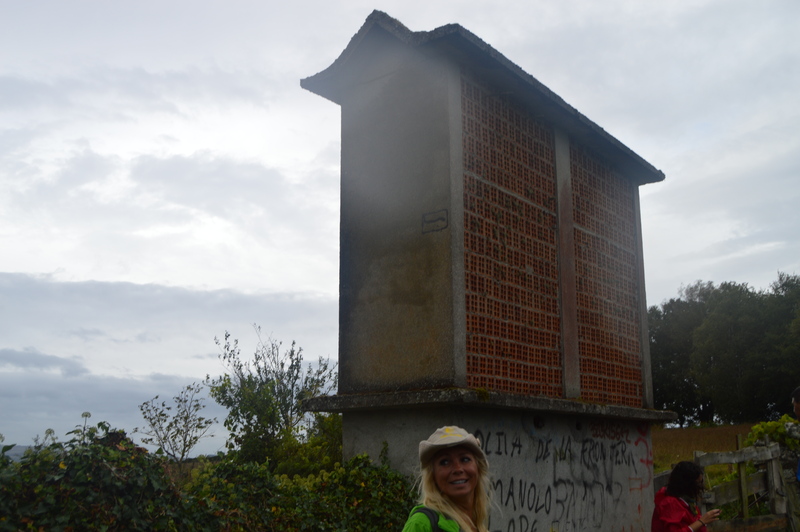 Past Pilgrims will recognize this–there are always times you need to slip off the trail to pee. Day 26 was easy peeing–no one was gonna surprise you from behind. Heck, Jim could have peed his pants and no one would have been there to witness it. Unfortunately, the way didn’t have many sights either. 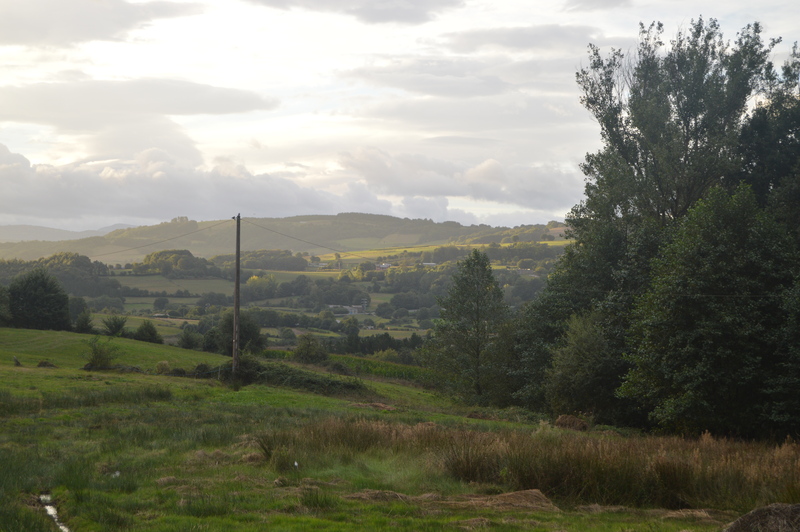 Photos from yesterday were few and far between. We finally quit taking pictures of the quiet streams along the way yesterday. Yesterday was a quiet stream. Things could not have been more different on Day 27. We hit the path about 8 am. 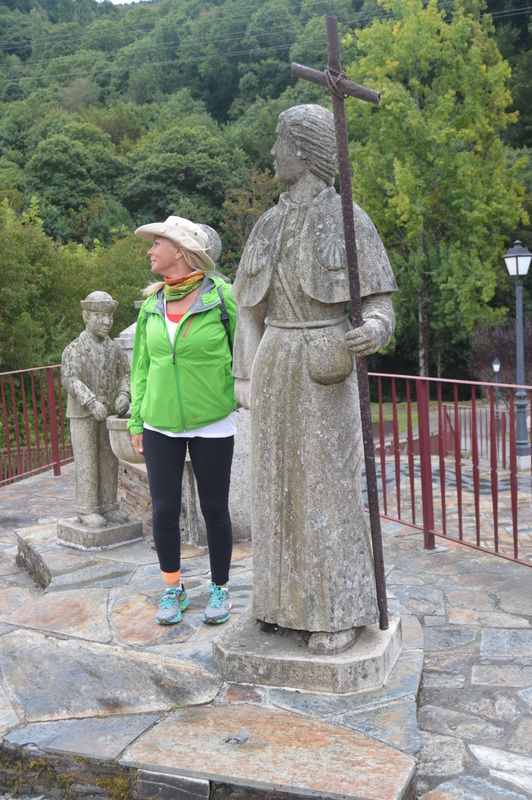 Leaving Hotel Alphonso in Sarria, we were quickly on the Camino and immediately were aware of the change in population. We were passing and being passed by Pilgrims all day. It felt like the roller derby, without pink helmets and elbow pads. Jim wanted to put his two hands to his waist whenever we passed a new Pilgrim for the points that would have been awarded if he belonged to the Steel City Derby Demons–look it up, it’s a real roller derby team! Now before you purists hate us for this, be aware–We are kidding!! Having been new Pilgrims only four weeks ago, we recognized the excitement and uncertainty that many of today’s new folks were feeling. Lots of unwrinkled shirts and shorts and pants. We think at least 70% of the crowd had just joined the fray. Not us–We are the wily and wrinkled veterans. We have that hardened squint, that certain gait. 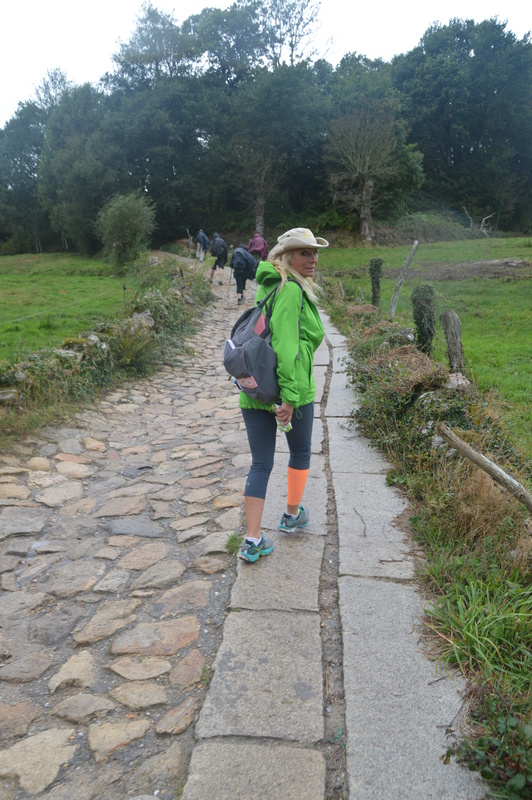 The walk out of Sarria is mostly uphill for the first seven to nine kilometers and by the time we reached mid-stage, the crowds were spread out. There were lots of bars to stop at, and almost all of them were packed. One elderly pair from Texas–new on the trail–decided that they could use their elbows–if not on the trail, at least at the bars, and they worked hard to make certain they were first to be served, first to use the potty, first, first, first. It was different out here today. By 1 pm, when we were passing over the bridge into Portomarin, it was colder. Everyone had tested their rain equipment. There aren’t many Michiganders on the trail, but we found one along the route today. John, from Greenville, introduced himself to us when we made our first bar stop today. John has found a walking group from several countries and he’s obviously having a great time. During our time together, he told us of his work in the tool and die business and his work as a lay minister in the Michigan prison system. 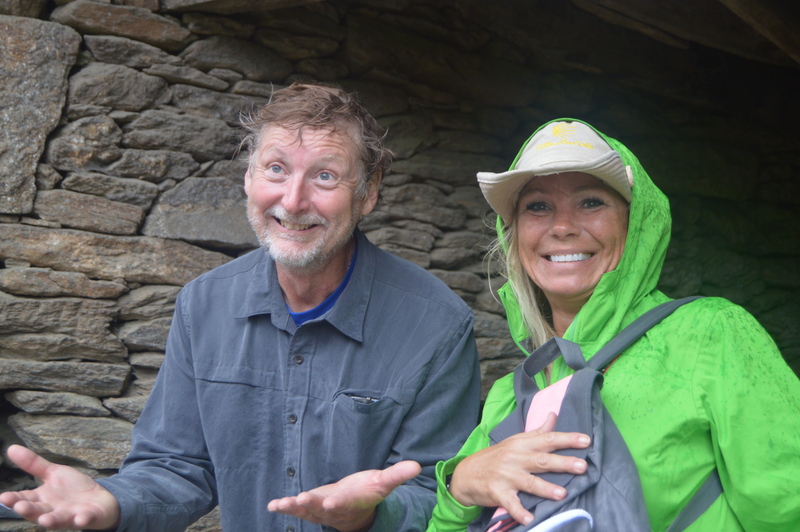 But, like every relationship on the Camino, John ran into a group of buddies under a rain shelter, just as it was getting wetter and wetter. We kept going. John sat a while. 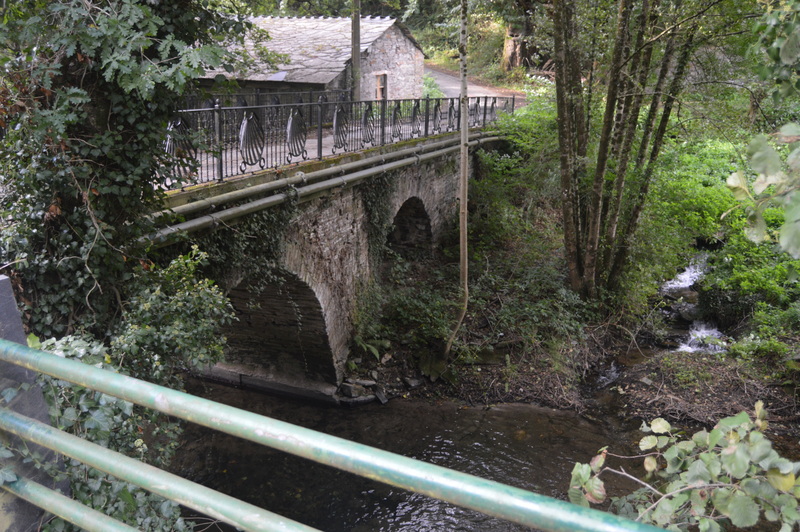 If Sarria is interesting as the start of the Camino for many Pilgrims, Portomarin is interesting for its bridges and history. In the second century the Romans built a bridge across the river here which was later to be destroyed by Doña Urraca the Queen of Castilla. A few years after she destroyed the bridge she ordered a new one to be built. 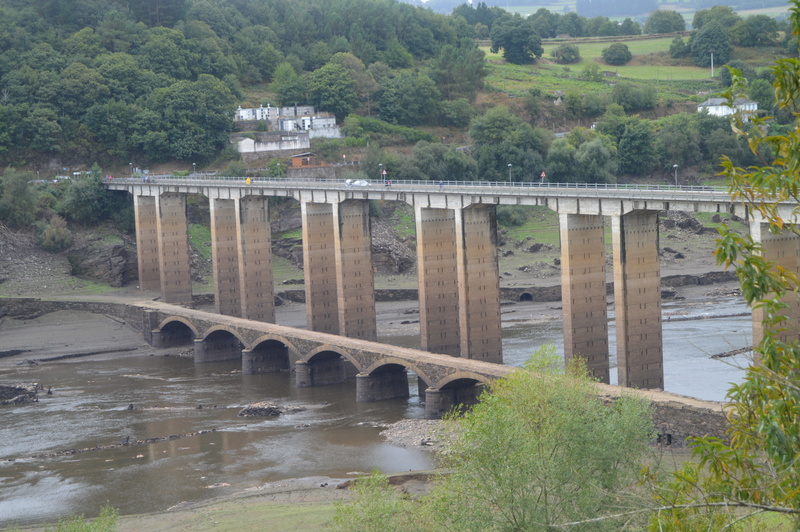 Today the old bridge was evident next to the new bridge, which is much taller–much, much taller. The town today dates mostly from the middle of the 20th century with much of the old town now below the river. 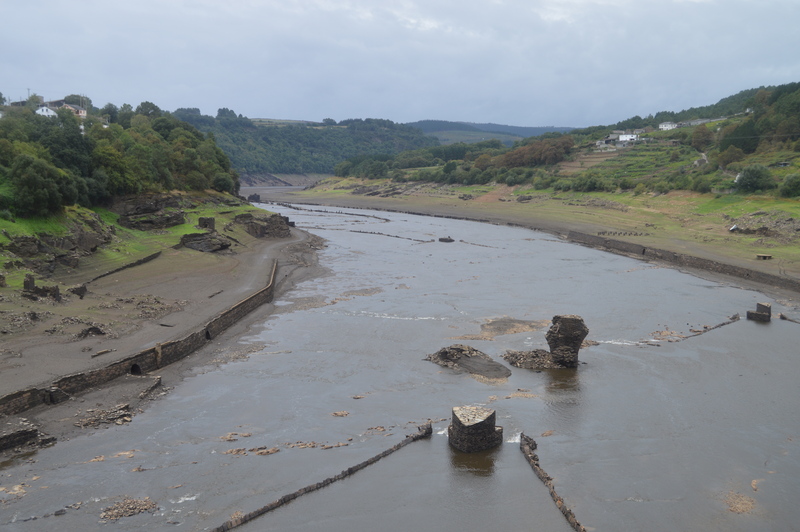 In the 1950’s Spain’s rulers decided to build a hydro electric dam 40 kilometres down river and in doing so would flood the town of Portomarín. The townspeople wanted to save some of their most important monuments and transported these stone by stone up to their new home high above the river. The monuments moved included the a couple of churches and some of the important 16th and 17th century manor houses. Jim is not a bridge or heights lover. The bridge that leads into Portomarin is very tall. Pilgrims, including Jim and Jackie must walk over the new very taller bridge to reach the town. Jim just hung on the rail til his knuckles were blue. Jim, I didn’t like that bridge either. I was wishing I were on the old one—and I am not usually afraid of heights! Buen Camino! p.s. I love the bits of history you put in your posts.